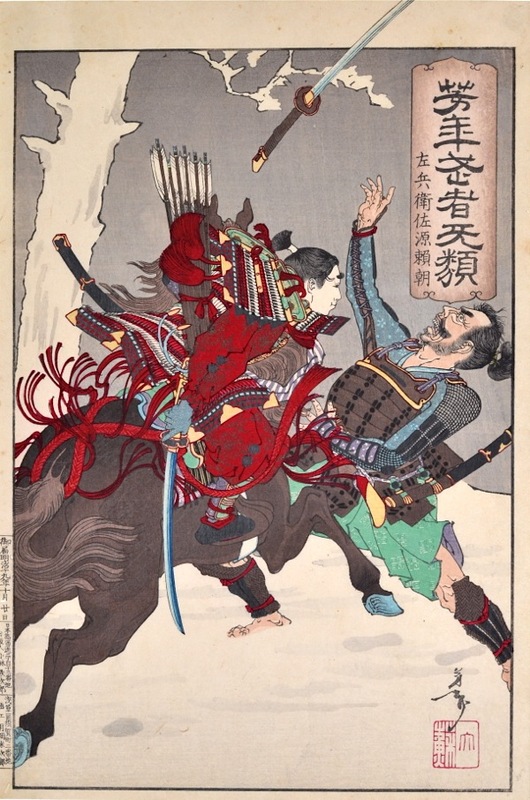 Taiso Yoshitoshi (1839 - 1892) Minamoto Yoritomo (1147 - 1199) on Horseback Attacking an Enemy, 1886. Oban. A very fine example of Yoshitoshi’s bold, groundbreaking approach typical of his mature style. He pictures the famous samurai hero Minamoto Yoritomo in battle. The exuberance of this design is really outstanding - the forward thrust of the mounted hero, and the flying sword of the opponent, breaking the frame of the picture - leaping off the page. The print is typical of Yoshitoshi’s work of the period - bold colours and very crisp sinuous key lines that lock the design in, combined with a frankly European drawing style; especially noticeable in the effortless depth of field and the easy drawing of objects in space. This mature, hybrid style is frustrating to attribute. There is so much of late nineteenth century European graphic style in the description of detail and in the flow of the line, but I am also persuaded that Yoshitoshi was in fact an important influence on western drawing styles following the flood of Japanese prints into western markets and their ensuing popularity. Yoritomo was the founder of the Kamakura shogunate, or bakafu and a member of the Minamoto warrior clan. Yoritomo was banished in his youth as a consequence of his father's revolt against the reigning Taira family. In 1185 he defeated the Taira and in 1192 the emperor granted him the title of shogun, which made him the supreme authority over all military forces in the country. He established his own governors, placing him in competition with, and gradually superseding, the power of the imperial court; a structure which prevailed until the revolutions of the 1860’s. 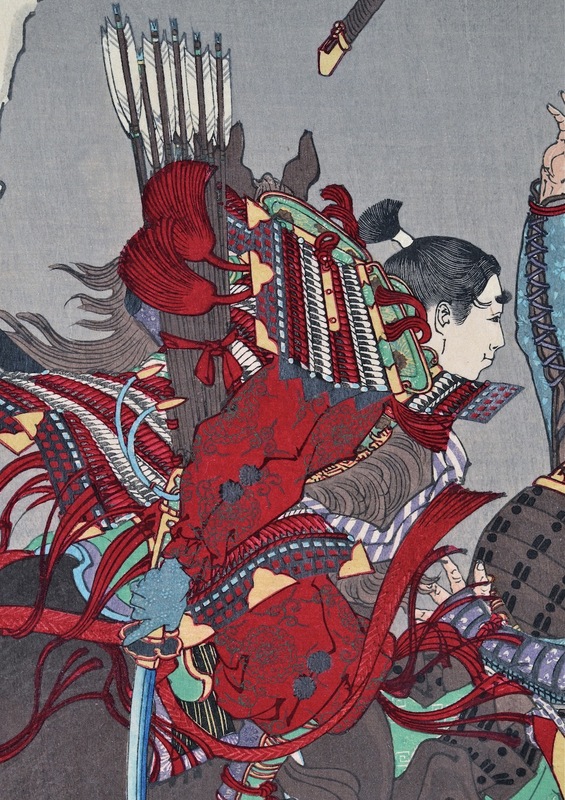 Yoshitoshi is once again looking back at the heroes of feudal Japan, albeit in a progressive style. A great print, very fine colour impression and condition with areas of burnished black. Margins and marginalia with small album binding holes on the left edge. Signed Taiso Yoshitoshi ga, published by Kobayashi Tetsujiro.